I'm trying to create a radius along an edge 3,000 mm long. I am being told by Creo that I cannot enter a value lower than 0,30, but I would like to use 0,25. Is it to do with the minimum radius setting being a percentage of the edge length? How do I fix this please? you have a long model (3000 mm) and small radius. 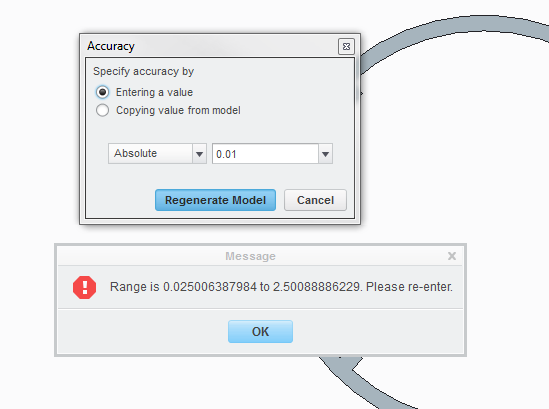 Therefore you have to change model accuracy from relative to absolute and find appropriate value. Thanks Martin. When I go into "Prepare model" I can only specify a new relative value (currently 0.0012). How to I determine absolute, please? put the following options into config.pro and restart Creo. Thanks Chaps, I'm getting there slowly, but not I'm quite there yet. What is this value actually linked to when relative (a percentage of the maximum edge length in the model?) and what is it driving when absolute, please? Thanks again guys. I take it that smaller numbers mean a higher shortest edge : longest edge ratio can be achieved?